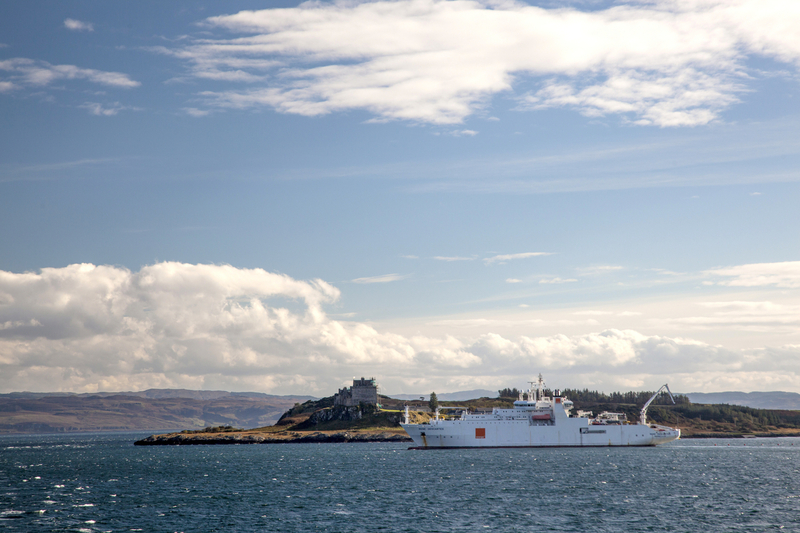 Some twenty seabed crossings involving the deployment of some 250 miles of fibre optic cable have now been completed in Scotland and will definitely help to take faster broadband to the more rural parts of Scotland. The project cost some £26.9m and is part of the larger £146m Digital Highlands and Islands roll-out. "Today marks an incredibly important step in the completion of the most complex ever underwater engineering that Scotland has seen. It is a hugely impressive technological feat that work has been completed in such a short timescale. In the coming months, thanks to the Digital Scotland Superfast Broadband Programme, many island communities will start to benefit from fibre broadband – that otherwise would not have received coverage. The rollout of superfast broadband will allow many households across our islands to connect to fibre broadband services for the first time, as well as giving businesses the opportunity to enhance their services. The work to improve broadband for those on the various islands is not complete, while Orange Marine have done the undersea work, Hampshire-based A-2-Sea Solutions have been working to connect the undersea cabling to the BT network on land and of course cabinets need deploying to bring up to 76 Mbps VDSL2 services to the homes and businesses on the islands (some premises may see FTTP as their superfast option, but the majority will be FTTC based). It is good to see and the cost is itemised. It will interesting given it is 100% publicly funded how the mobile operators can use them. missing zero in previous post should read "with the 100% publically funded......"
The lucky lot. Living on a Scottish Island and having fast broadband. I'm jealous! Nice to see that most connections are resilient with just Westray, Barra and Tiree dependant on a signal connection which could take a while to fix in the event of a cable break. Nothing in Shetland though? Sorry that should read single connection. @glasspath, Shetland is connected to the SHEFA-2 undersea fibre cable which links back to Orkney. That's living on a Scottish Island and will get Fibre sometime after next year. Just cause the cable's in doesn't mean that broadband is faster. We had 6MB at the moment if we get 1.5MB we are lucky. Thanks ccxo. 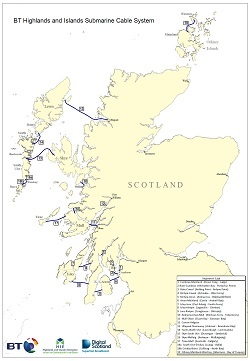 I was also thinking about the several islands in Shetland, Yell, Unst (and smaller ones) - I guess they'd need a sea cables too. 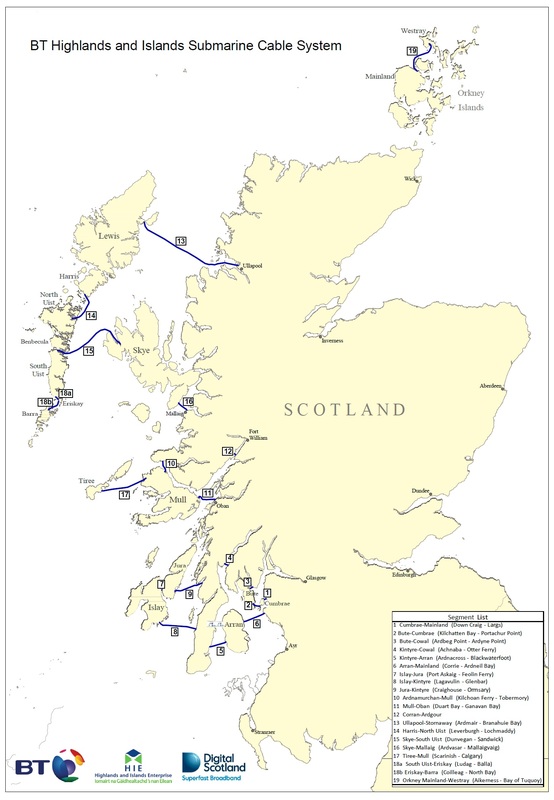 Wireless broadband from Shetland broadband is used by some communities across the islands. Openreach are expanding their network across the Shetland mainland in 2015 according to the Highlands and Island project, have to wait for further plans. A good friend of mine lives in Otterferry and the cable passed his front door it will be interesting to see how long it is before he gets a faster speed than the barely 1 meg he gets now.